....thought back in it again! First new post of the year and this is a brilliant puzzle that really kept me going - proving that I am not terribly bright! Back in November I had a little epiphany about packing puzzles....I needed to start thinking outside the box. One of the most important triggers for this was a brilliant puzzle that I bought from Eric Fuller - the One Hole designed by Bram Cohen. But even before this I had a trial run when Brian Menold sold me a beautiful copy of the L-I-Vator cube designed by Laszlo Molnar (apparently who is also known as Lacika Kmolnar). The L-I-Vator taught me that there were quite a few steps to be done between assembly of the basic shape outside of the box and the actual packing it in. The requirement for rotations of more than one of the pieces made it a really fun challenge and I loved it. It was not hugely difficult but certainly had a couple of brilliant A-ha! moments. When Brian announced that he was producing another of Laszlo's creations, the Triagonal Agony, I promised myself that I would jump as soon as the went up for sale. I was actually on-line at the moment that Brian made his announcement that they were up for sale and quickly added my preferred one to my shopping cart along with another beauty (the Tropical Fish). There is an odd quirk of the shopping cart that Brian uses that allows puzzles already in someone's cart to be snatched out by someone else buying before the original purchaser gets to the checkout. This has happened to me several times over the years and Brian always tries to make good on it if you ask him about it. Apparently it was my turn to do the snatching! Hooray! I got there first! I ripped the copy out of someone else's cart when I paid. A day or so later Brian emailed me to ask whether I would agree to let that one go and he would make me another copy using the same woods as my L-I-Vator cube. 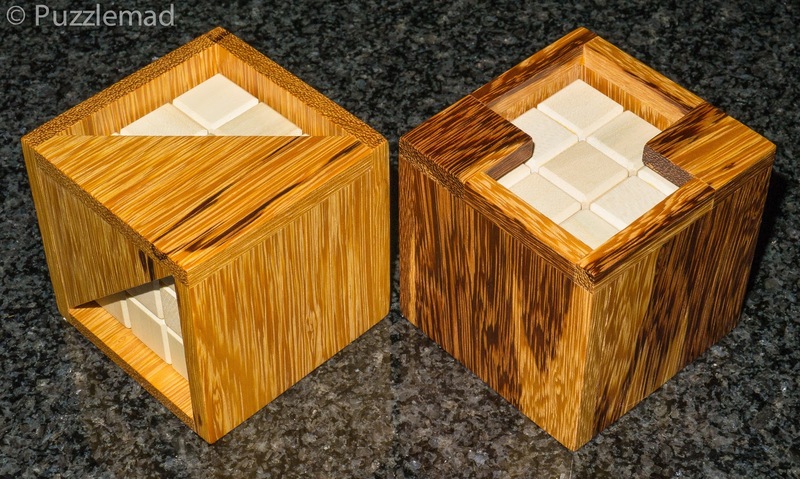 Well I hate to disappoint anyone and I trust Brian implicitly so of course I agreed and a few weeks later I received my new toys with the Triagonal Agony being made out of Holly and Marblewood to match my other puzzle. Was it already partially solved? I was worried that this cube shape that it arrived in for packing purposes was going to give it away so as soon as I unwrapped it, I dismantled the cube without paying even the slightest bit of attention to the positions. After a little while admiring the beautiful wood and finish, I went straight to work on it (after the photos of course). I was a little stunned when it took me about 45 minutes to get the pieces back into cube shape! That was a rather tough challenge in it's own right. But having done that it was time to work out how to fit them into the box. This time the box has 2 triangular openings and the pieces can only fit through in a certain orientation. In fact the bevels on the pieces literally won't allow you to sneak them in at an angle and straighten up once inside. This quickly became very frustrating. After a while of seeing what type of insertions and positions were going to be possible, I thought I had it sussed out. With 2 openings, I realised that 2 of the longer pieces might need to be placed at 90º to each other (maybe as the last pieces to be inserted). Oh boy! This shows how easily you can get sidetracked by a single idea and fixated on how it has to be correct! 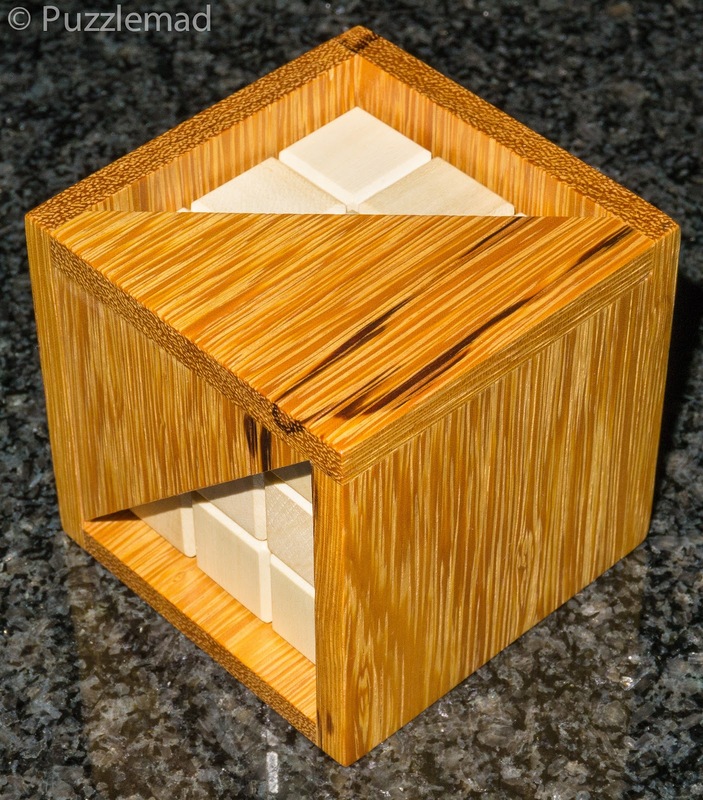 I spent HOURS and HOURS trying this with the cube I had constructed. Of course I failed! Thinking outside the box had mislead me....it was time to think again. I did not want to spoil it but decided to quickly play with Burrtools to establish whether my assembly of the cube was unique. 5 minutes later I began to bash my head vigorously against a wall!! 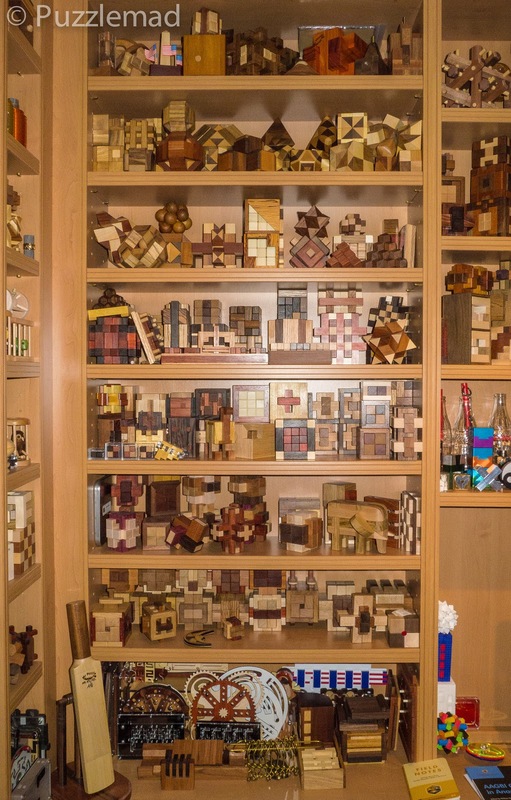 There were 13 possible different assemblies of the pieces into the cube shape. I was a little worried because it had taken me 45 minutes to find the first one - this puzzle could take me years! I did not want to sit in front of Burrtools and assemble the cubes and try to insert them one at a time into the box. I wanted to do it without the computer if possible. My next problem was how was I going to keep track of the assemblies that I had tried? I'm a sucker for pens and notepads and have a rather large collection of Field Notes booklets and so sat down and sketched my first cube assembly very roughly to show the positions of the pieces. I'm not much of an artist but it did the job. Next step was to find another assembly... this time it only took me about ½ hour. I was rather worried that as I went through the different assemblies it was going to take me longer and longer to find them. During this time I was contacted my Laszlo who asked me to correct a spelling mistake on his name from my initial post and we discussed this puzzle too. He was a little worried that he had made it too difficult; he had several different versions that he could have used but chose this one with the 13 possible assemblies as the toughest for the puzzle world to play with. I reassured him that we like a challenge and that I was enjoying persevering with the Triagonal Agony. Over the next few weeks I worked on it off and on - I put in a good few hours trying to be systematic. I would search for an assembly and then compare it with my previously found ones before spending hours trying to insert it into the box. It was beginning to get disheartening and a bit repetitive. Time to think! How was thought going to help me here? Surely it is just trial and error? This is one thing that I dislike about packing puzzles and some pattern assembly puzzles - there is too much laborious trial and error! I had worked on 4 assemblies so far and failed completely - why? What were the common reasons that they failed? A-ha! Another epiphany! Looking at the pieces and how they were able to go inside was not helpful but looking at what was preventing them from going in always had a common feature - a certain pair/trio of pieces were always at 90º from each other and blocked the required rotations. 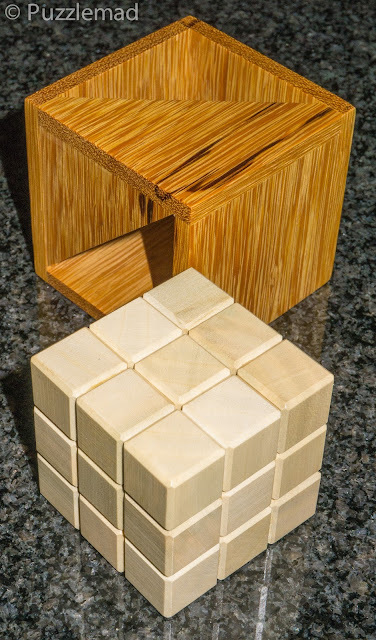 Instead of searching for rotations on random cube assemblies, I should search for a way to make the cube with 2/3 of the required pieces parallel to each other and then they would not block the insertion. 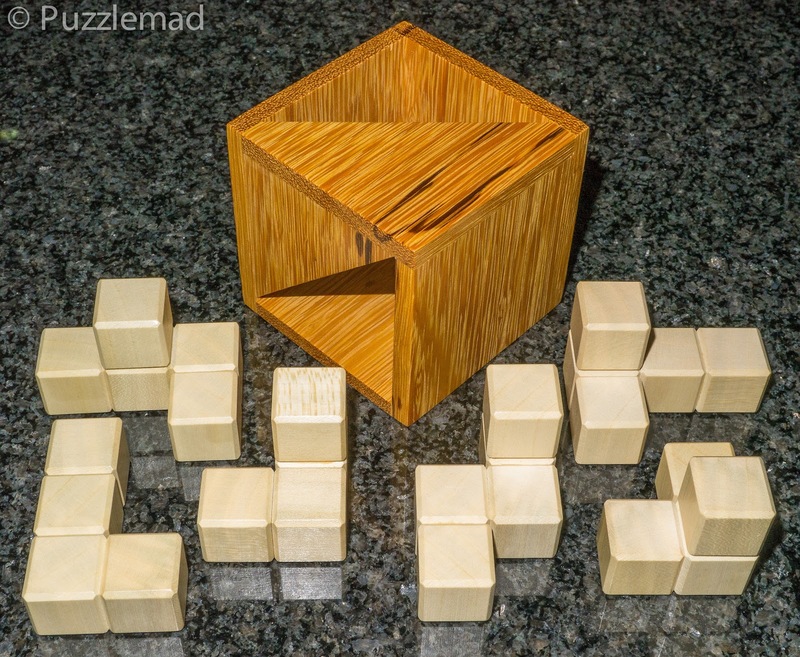 A stunning looking and a stunningly tough puzzle! In retrospect, I should have seen the method much earlier - I am sure that there are better packing puzzlers than me out there who saw it in a few minutes and just solved it straight away, but remember that I am really not terribly bright! I had been lulled into a false sense of security by the idea of thinking outside the box - this was only a small part of the solution. I needed a further epiphany of understanding - why were certain insertions and rotations blocked and how could that be avoided? Once I understood that it was a "simple matter" (Blush) of finding an assembly that met the required criteria. All in all this puzzle took me dozens of hours over a period of nearly 5 weeks to solve making it extremely good value for money! Now of course, I have a beautiful pair to display together and will look forward to more challenges from Laszlo. They are on display on the third shelf sown of my main display in the study (My Menold collection has started to grow onto other shelves). Great, entertaining review as always. I thoroughly enjoyed the L-I-Vator cube. I'll have to try this one someday as well. Or I should say, some weeks!